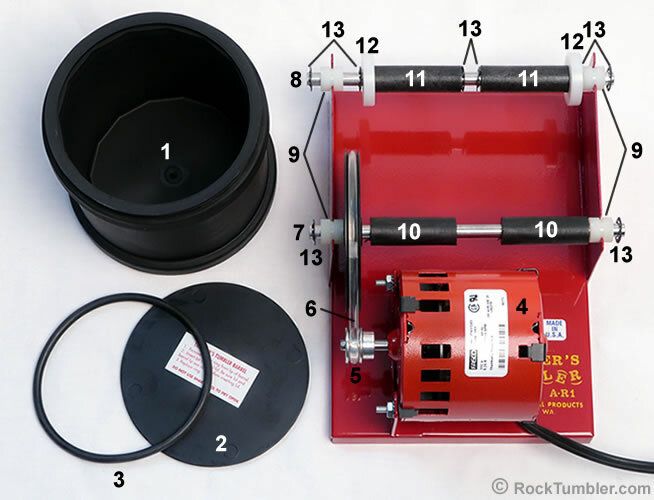 What is Thumler's A-R1 Rock Tumbler? 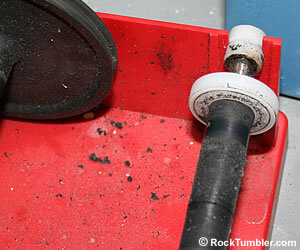 The Thumler's A-R1 is a hobbyist rock tumbler built to last for years of use. It has a durable metal base and its soft rubber barrel enables it to run quietly. It has a high quality motor that is overload protected for safety. This tumbler is purchased by both beginners and experienced people who run small batches of stones. It is the perfect first rock tumbler for just about anyone. The A-R1 is a single barrel rotary tumbler that can process about two pounds of rough into beautiful tumbled stones. We sell this machine as a kit that includes all of the rock and supplies needed to produce one batch of of tumbled stones. It also includes a small jewelry findings kit to make a pendant, a pair of earrings, and a key chain with your finished stones. All you need is some glue. How Much Rough Is Needed? The A-R1 rotary tumbler barrel can process about two pounds of rough rock that, after tumbling will yield a nice number of polished stones. The weight is not an exact amount that will be the same every time. The specific gravity and size of pieces will be different, so measuring out a specific weight to use is not recommended. How full you fill the barrel is more important than how much weight is in it. Learn why how full the barrel is so important here. How Full Do I Fill the Barrel? Every time you load a rotary rock tumbler barrel it needs to be about 2/3 to 3/4 full to obtain the best possible results. If the barrel is over 3/4 full there is not enough room for the rocks to tumble inside the barrel. If the barrel isn't full enough the rocks will get tossed around and some might be chipped or bruised. Tumbling all large pieces is not as effective as tubling a range of sizes. We recommend using rough that is between about 3/8 inch and 1 1/2 inch along its maximum dimension. The largest piece of rough should be no more than half the barrel's smallest dimension. The barrel for the A-R1 has an inside height dimension of 3 7/8 inches and a diameter of 4 inches. So for this barrel we do not recommend anything larger than about 2 inches. We recommend no more than two or three pieces that size surrounded by smaller material. particle size balance is important to getting great results. A squeaking A-R1 tumbler is often caused by the bearings not being oiled. The bearings need oiled once a month. The most common cause of a squeaking tumbler is the bearings. Oiling the bearings will usually eliminate the squeaking. Before you put fresh oil on the bearings you should clean them and the shaft with Dawn dishwashing soap and dry everything thoroughly. Dirt or grit particles getting in the bearing can cause damage to the bearing or shaft. The bearings need oiled once a month to keep the A-R1 tumbler operating smooth and quiet. For detailed oiling instructions visit our article about oiling a Thumler's tumbler. Should The Motor Be Oiled? Yes, the motor should be oiled once a month. There are two oil ports on the top side of the motor. It only takes one drop in each port once a month to ensure that your motor is kept in good running order. Please do not use more oil than recommended because excess oil will attract dirt. What Are The Back Particles on My Tumbler Base? The black particles you are seeing on the base are little pieces of the rubber barrel. This is common with a new tumbler barrel or barrel guide and should not be cause for concern. As the barrel rotates on the idler shaft it will "walk" to the left or right and rub against one of the barrel guides. As the guide and barrel rub against each other friction will cause pieces of the barrel to shed. After the barrel shapes to fit the guide the amount of particles removed will decrease and eventually stop. IMPORTANT: After turning your A-R1 tumbler on, watch to see which way the barrel "walks". Make sure that the bottom of the barrel is the side rubbing against the barrel guide. If the lid side rubs against the guide you will wear off the lip that holds retainer ring in place. If the retainer ring is not able to hold the lid securely it will not create a water-tight seal between the rubber barrel and lid. Should The Motor Be So Warm? Yes, rock tumbler motors will run very warm to the touch. That is normal. The Thumler's A-R1 motor is thermally protected and will stop operating if it gets too hot. This is why you do not want to run the tumbler in an extremely warm environment, direct sunlight or in an enclosed space. Check out our Where is the Best Place to Run Your Tumbler article for other tips to help you decide where to operate it. Absolutely, we carry all Thumler's A-R1 parts with the exception of a new base. While these tumblers are built very well, after many batches of stones you may need a new belt or a new lid or retainer ring. These parts are quick and easy to replace. Many of our customers have A-R1 tumblers that have been in use for decades. If you lubricate the motor and bearings, and keep the machine clean, it should last for a very long time. We have customers who received a tumbler as a child, used it with their own children, and are now tumbling stones with their grandchildren! 1) Rubber Barrel - The rubber barrel dampens the sound and will last through many batches. 3) Barrel Retainer Ring - Secures the lid and creates a watertight seal. 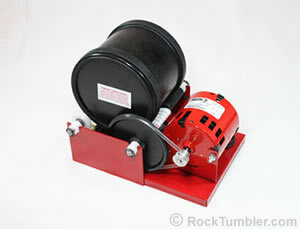 4) Tumbler Motor - Durable motor that is overload protected for safety. 6) Tumbler Belt - Goes over the motor pulley and drive shaft pulley to rotate the barrel. 7) Drive Shaft - Components are two rubber rollers, drive pulley, two bearings and two shaft retainer clips. 8) Idler Shaft - Components are two nylon rollers, two barrel guides, two bearings and six shaft retainer clips. 9) Bearings - There are four bearings, one on each end of both shafts. Oil these bearings once a month for continued smooth and quiet operation. 10) Rubber Rollers - There are two of them on the drive shaft to grip and turn the barrel. 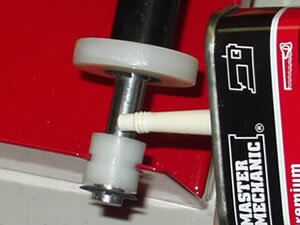 11) Nylon Rollers - There are two of them on the idler shaft to help the barrel rotate smoothly. 12) Barrel Guides - Located on the idler shaft to keep the barrel on the shafts. 13) Shaft Retainer Clips - Hold the barrel guides, nylon rollers, and bearings in place on the idler shaft. There are also two on the drive shaft to keep the bearings in place.